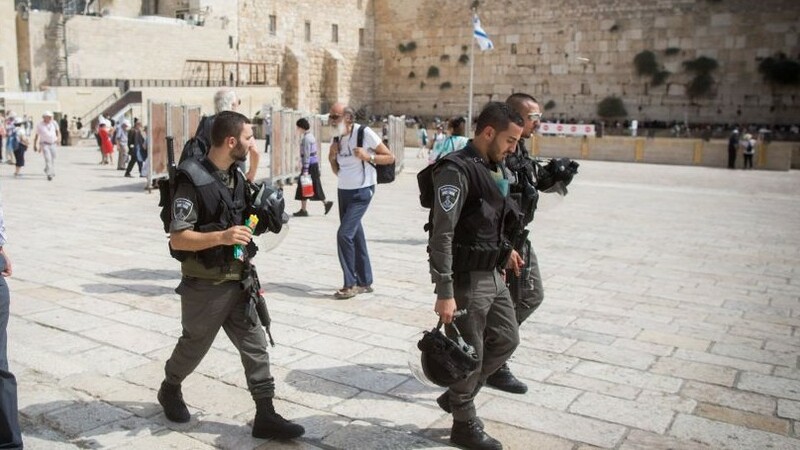 The commander of the Israel Police said Sunday that the force would not tolerate any efforts to harm human life, in particular on the Temple Mount, a flashpoint site holy to Jews and Muslims that had seen clashes earlier in the day. He was speaking after police discovered pipe bombs during what they said was a preemptive operation at the Mount as Israel geared up to celebrate the Jewish new year. “Israel Police will not allow any harm to public security or the sovereignty of the state in general, and at its capital or the Temple Mount in particular,” said interim police chief Bentzi Sau in a statement published on Facebook. “The responsible and exact actions of the commander and police of the Jerusalem District, in conjunction with members of the Shin Bet [domestic security service], prevented in a timely manner an extreme and dangerous attempt to harm human life and undermine stability and order on the eve of the holiday,” the statement said. 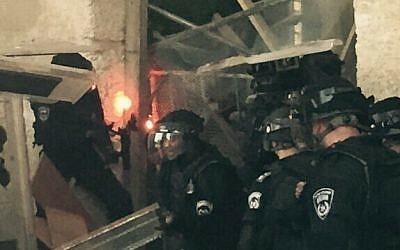 Clashes between Muslim visitors and Israeli police frequently occur on the Temple Mount, which is considered Judaism’s holiest site and Islam’s third-holiest. Visits by Jews are allowed to the complex, but Jewish prayer is prohibited. The police statement was accompanied by a video said to show masked Palestinians preparing for a showdown with Israeli security forces earlier Sunday. "משטרת ישראל לא תאפשר פגיעה בבטחון הציבור ובריבונות המדינה בכלל ובבירתה ובהר הבית בפרט", כך אמר מ״מ המפכ״ל, ניצב בנצי סאו, בהתייחסו להתפרעויות הבוקר בהר הבית ולתפיסת מטעני הצינור. "פעילותם האחראית והמדויקת של מפקדי ושוטרי מחוז ירושלים, בשילוב גורמי שב״כ, סיכלה מבעוד מועד ניסיון קיצוני ומסוכן לפגוע בחיי אדם ולערער את היציבות והסדר בערב החג. נחישות הכוחות ומיומנותם הרבה הם שאפשרו את שימור חופש הדת והפולחן. על הציבור בארץ לדעת שיש לו על מי לסמוך ולמי לפנות בעת הצורך". מ"מ המפכ"ל הוסיף כי בשעה זו, ולאורך כל ימי החג, פרוסים אלפי שוטרים בכל רחבי הארץ, כשהם ערוכים ומוכנים להגיב לכל תרחיש ולהיענות לפניות הציבור. השוטרים הונחו לפעול בנחישות כלפי כל מי שיעבור על החוק, יסכן את שלום הציבור או ינסה לשבש את הסדר. "ההיערכות המשטרתית מקיפה ולא חסכה בדבר, הכל למען בטחון הציבור ותחושת הביטחון של המוני בית ישראל". 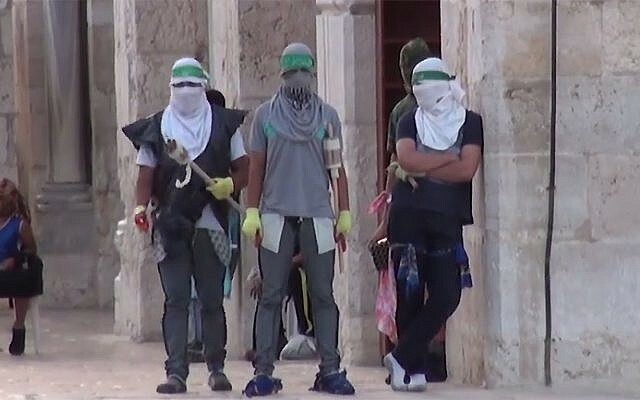 Palestinian witnesses to the early morning disturbances said police entered the Al-Aqsa Mosque on the Temple Mount, while police said they only closed the doors to the mosque to block in rioters throwing stones, fireworks and other objects. 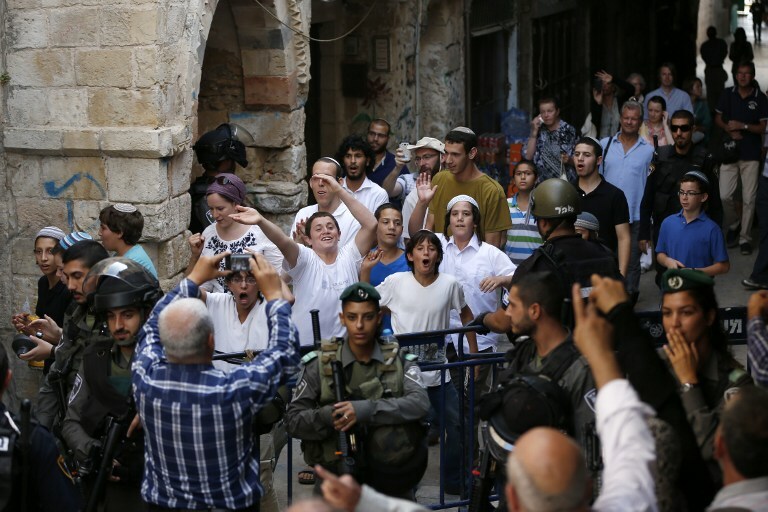 Intelligence information gathered by security forces revealed a plan for an organized riot on the Mount, with protesters stockpiling rocks and firecrackers as well as a barricade at an entrance to the mosque, police said. 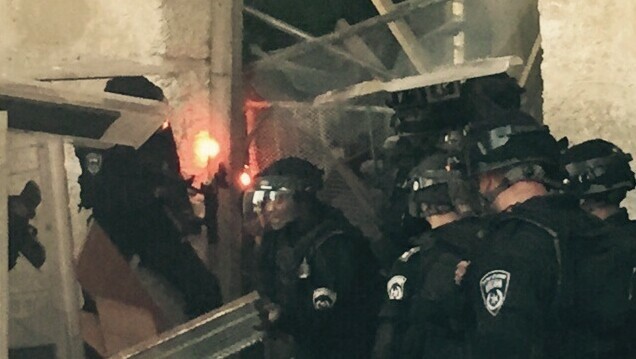 According to police, the demonstrators intended to disrupt the movement of Jewish visitors to the compound ahead of the Rosh Hashanah holiday, which begins Sunday evening. The discovery of the pipe bombs prompted Public Security Minister Gilad Erdan to warn Sunday that Israel would review measures at the site. 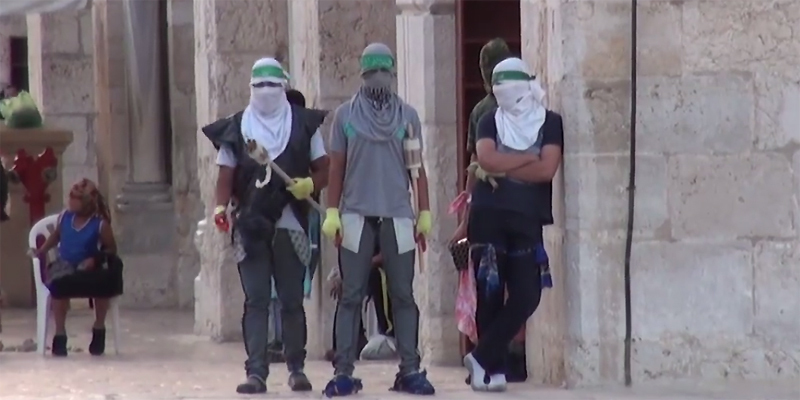 “It is unacceptable that Muslim rioters who barricaded themselves during the night on the Temple Mount can, at will, turn this holy site into a battlefield, including throwing stones, shooting firecrackers directly at security forces, and even bringing explosive devices into the area of the mount,” Erdan said. Police later confirmed that the objects were pipe bombs. The Palestinian Authority, Jordan and Egypt slammed the Israeli government for the incident, with Palestinian Authority President Mahmoud Abbas accusing Israel of carrying out an attack on the mosque. 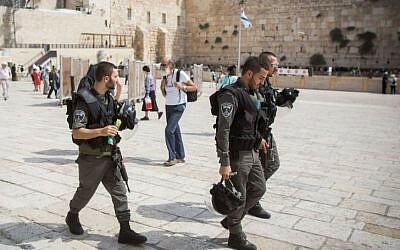 “The presidency strongly condemns the attack by the occupier’s military and police against the Al-Aqsa Mosque and the aggression against the faithful who were there,” said a statement from Abbas’ office. Jordan also rapped Israel for the incident, and urged it to stop “provocations” on the Temple Mount and warning against attempts to change the “status quo” at the site. 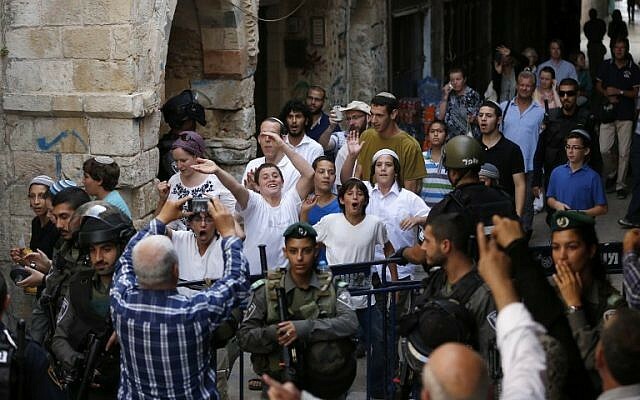 Security forces stand guard as a group of Jewish youth leave after visiting al-Aqsa mosque compound in Jerusalem’s Old City on September 13, 2015. Jerusalem Police Commander Moshe Edri said the success in preventing any disruptions was a credit to the security forces.